Hi! I’m still getting adjusted to the time change. I think I woke up at 4:30 (6:30 my time”, saw the darkness outside the window and went back to sleep. Woke up an hour later, still dark and played a Scrabble game on my phone and fell back asleep. Finally got up and went to the breakfast buffet! 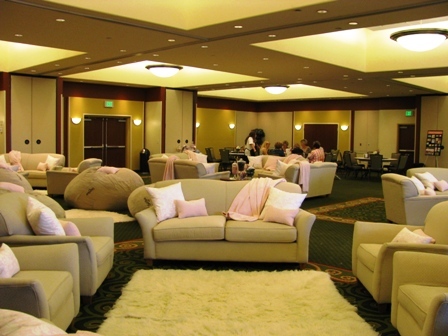 After breakfast, we headed to the Gathering place and they had added more chairs and these amazingly soft bean bags! Jan helped me finish assembling my swaps for tonight! 135 done and ready to go! 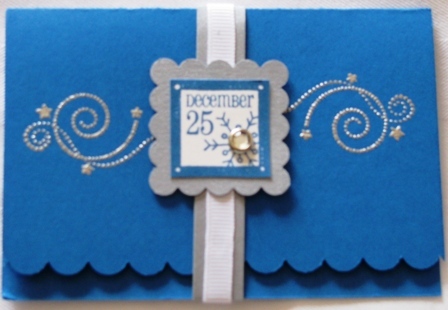 These are gift card holders using the Spotlight on Christmas set, silver cardstock and embossed in silver. 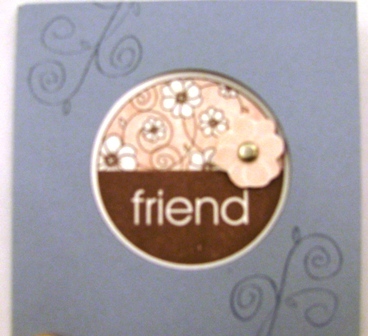 This is the front of the album we made. 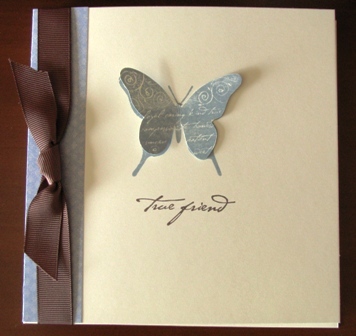 The butterfly was stamped twice with Bordering Blue ink on vanilla cardstock – once on the cover and once on a scrap piece and cut out the body. 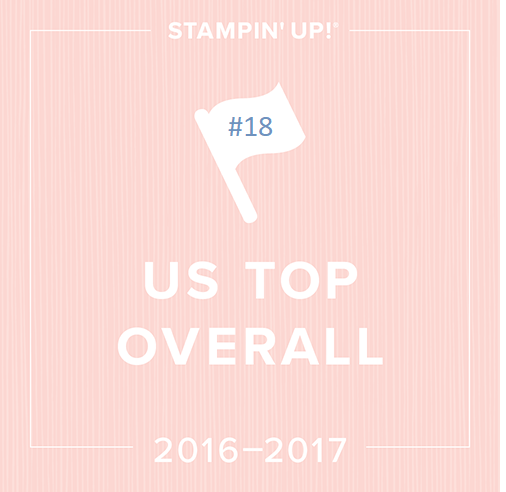 Jan and I showing our accomplishments! LOVED this little guy! 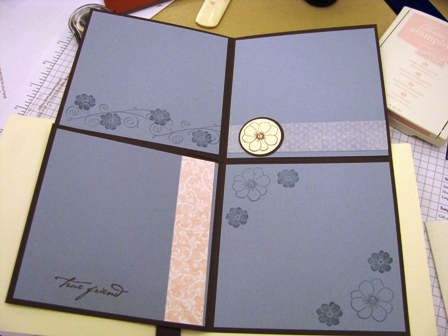 It is a Tri-fold with a window, punched with our new big circle punch. Bordering Blue cardstock. 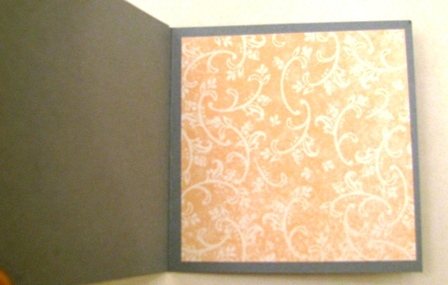 Here is the inside: (the designer paper is Pink Pirouette but I’m a stamper not a photographer so it is tough to tell! 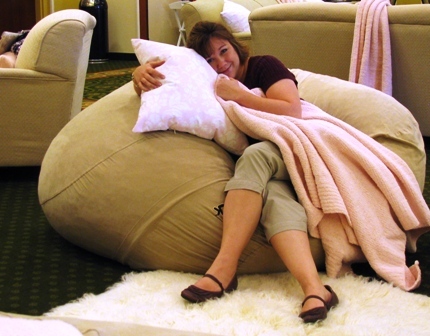 How adorable is this?! 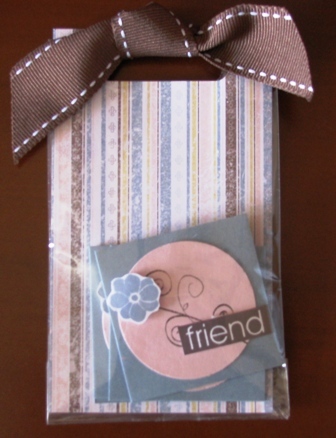 It is a small cello bag with a piece of designer paper inside. Then 3 little notecards are inside for a gift. The top is punched with the Word Window punch (cello and all) and tied with our stitched chocolate ribbon! This entry was posted in Stampin' Up Incentive Trips and tagged convention, demonstrator, rubber stamping, Stampin’ Up!, Swaps & Inspiration, video tutorials. Bookmark the permalink.